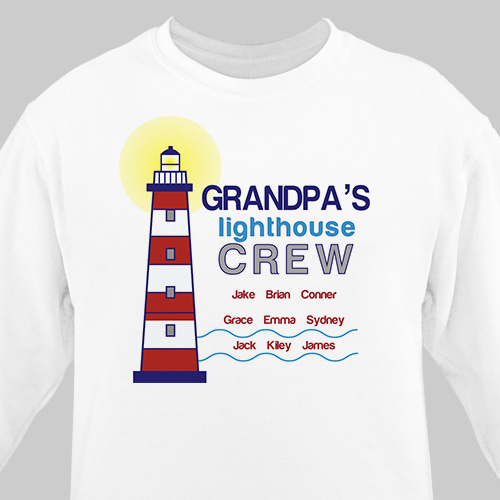 Outfit Dad or Grandpa and keep him cozy on afternoon boating trips with this handsome, Personalized Lighthouse Crew Sweatshirt. Dad Shirts make it a unique gift idea for him to enjoy this Father's Day, Grandparents Day or just because. This Personalized Crew Sweatshirt is available on our white, pink and ash gray, cotton/poly blend sweatshirt, machine washable in adult sizes S-3XL. Free personalization of any Title & up to 12 names is included. Additional Details GiftsForYouNow.com offers a large collection of Custom Printed Sweatshirts that make excellent Father's Day, Christmas or Birthday Gift Ideas. Browse through our entire collection to also find our Heavenly Blessings Sweatshirt & our USA Pride Sweatshirt as well.